I like a painting to remind me of something and I assign images to Dove’s abstracts whether or not he wanted that. Dove didn’t title this painting, perhaps to not suggest an image. I see this as a snail. 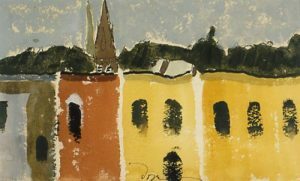 Dove’s watercolors of his time in Geneva, from 1933 to 1938, are more relatable than his abstracts. During warm months, he rose early, went into the woods or onto Seneca Lake, and made small sketches. Some were line drawings while others were more complete watercolors. 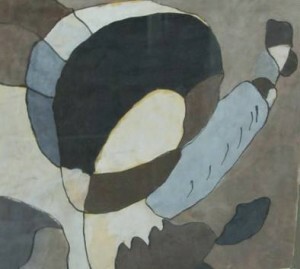 One of his techniques was to drag his brush in one stroke, letting paper show through as part of the art. While in Geneva, Dove painted over 100 watercolors per year. Some were framed, exhibited, and sold. Others he kept as “models” for paintings he created in the cold winter months. 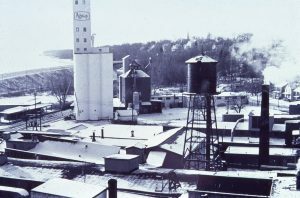 The Agway grain elevator (1937 – 1987) is the best example of Dove’s process. He did numerous sketches of this building, usually from a boat on the lake. 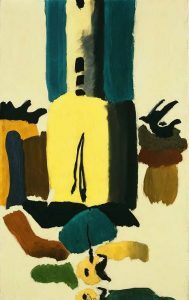 From them he created at least two abstract paintings. 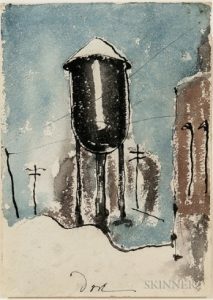 After Dove’s death, many of his watercolors were donated to collections or became available at auctions. Following are a few examples that I enjoy for the artist’s way of viewing commonplace Geneva scenes. This view of St. Peter’s Episcopal Church, on Genesee Street, was done from the lakefront. It’s a good example of Dove’s line work and dry brush technique. 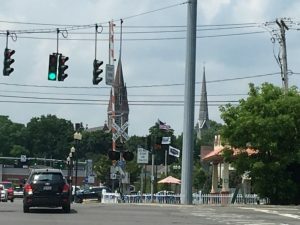 The diamond-shaped sign was a 1930s railroad crossing sign. He worked his signature into the back of a delivery truck in the lower center of the image. 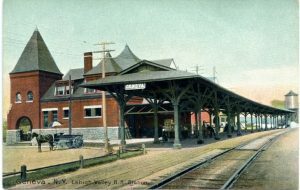 The Lehigh Valley Railroad passenger depot (1892) on the north side of Geneva was often photographed. The postcard shows the most common perspective. 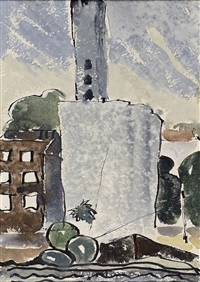 Dove focused on the water tower (far right in the postcard), with just a corner of the building in the painting. The willow trees along Lake Road are an iconic lakefront scene. 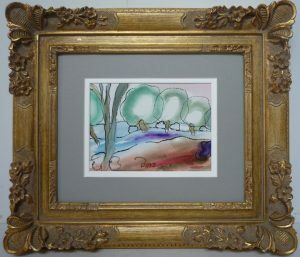 Dove’s scene featured his trademark orb-like trees and appears that he painted from the shore looking toward the lake. 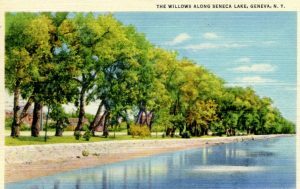 In the 1930s the Seneca-Cayuga canal still ran along the lake, possibly portrayed by the purple and blue band in front of the willows. From 1937 to 1938, Dove and Torr lived on the third floor of the Dove Block on the corner of Exchange and Castle Streets. This is one of a few sketches that Dove drew from his window. It looks northwest from his corner, showing the spires of St. Peter’s Episcopal Church (right) and North Presbyterian Church (left). 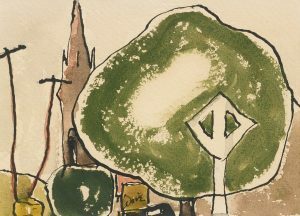 Dove’s Geneva, an exhibit exploring Arthur Dove’s family, and the Geneva that he knew and painted will be on display in the Geneva History Museum until the end of September 2018. You can also pick up a rack card detailing several buildings built by the Doves and where Arthur lived. Please thank John Marks for this post. Arianne and I are big fans of Dove and so enjoy the local connection. We see his work in museums all over. It’s fun. Enjoyed this article. Great to post photos related to Dove’s painting.